Customer Service: Mon - Sun 08.00-20.00. 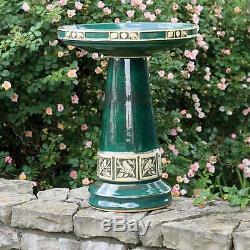 Glazed Ceramic Stoneware Bird Bath Antique Pedestal Garden Outdoor Water Bowl. 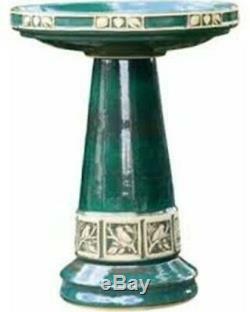 This fully glazed bird bath features the popular design in a green color. 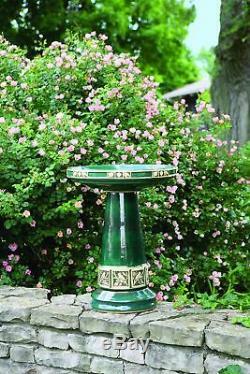 Made from quality ceramic stoneware, the pedestal-style bird bath has a 3.5-inch bathing depth. This style has an interlocking top to the pedestal base. Special Note: The ideal bathing depth is 1.5 to 2 inches. You can simply fill the bath with 1.5 to 2 inches of water, or you can take the decorative approach and use polished stones or similar items to raise the water level while keeping the bird safe. 3.5 inch bathing depth. Green color in Zanesville design. Top interlocks with the base. Dimensions: 17L x 17W x 21.75H inches. The item "Glazed Ceramic Stoneware Bird Bath Antique Pedestal Garden Outdoor Water Bowl" is in sale since Monday, February 4, 2019. This item is in the category "Home & Garden\Yard, Garden & Outdoor Living\Bird & Wildlife Accessories\Birdbaths". The seller is "shoptorch" and is located in Boston, MA. This item can be shipped to United States.